A recent survey of over 2,000 online GB adults, carried out by YouGov on behalf of IBM (NYSE: IBM), has found that over a quarter (28%) of those surveyed feel that at least 20% of the time they spend on email during their working week is wasted dealing with irrelevant messages, chasing people for responses and resending emails. 44% of the respondents received more than 20 emails a day and 4% received in excess of 100 a day, the equivalent of over 35,000 emails a year. statement: “I am aware of social collaboration packages and their business benefits, and would happily use them at work if they were available,” only 14% of email users agreed. Respondents also raised annoyances about junk mail, advertising and online scams and how impersonal email was. 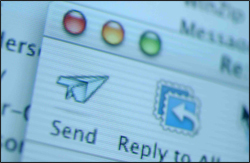 Email is undeniably a critical element of everyday working life. With an estimated 970 million business and 950 million consumer email users by 2014, it is not going away soon. However, email is definitely evolving from a static one-to-one exchange and is fast becoming the inbox for the social framework, allowing people to use email more effectively to communicate and coordinate information from other sources like social networks. This facility enables people to address many of the existing difficulties associated with email by expanding traditional functionality with complimentary tools that people are already familiar with from using social networks. Effective communication should be important as 35% of online Brits who use email have colleagues who are not based in the same location. 12% are working in a different workplace to over half of their workmates.